Wood thrushes are back! I heard one this morning in the wee hours before it was light. I thought maybe I was dreaming and just wishing it was true. But, I heard one again this evening on my way home from watering flax at Amethyst Brook, fully awake. To me, the song of the wood thrush is a sound of beauty, a perfect point between grounded earthiness and soaring transcendence. It is officially spring in my person calendar. After realizing my mistake with the first attempt at growing Japanese Indigo seedlings, I tried again. 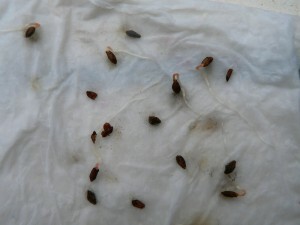 On April 25th, I laid out some seeds to sprout in damp paper towels. I’ve used this technique with beans before, but I didn’t think to try it with the Japanese indigo seeds until I heard from Laura Harris, a fellow Seed Savers Exchange member to whom I sent some of my seeds earlier in the spring, that she had done it. And ta da! Success! 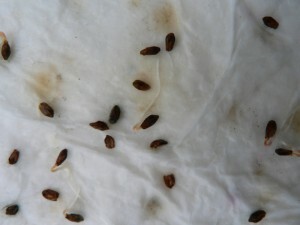 Here are a couple photos of the seeds once they germinated.